More than a hundred hydropower dams have already been built in the Amazon basin and numerous proposals for further dam constructions are under consideration. 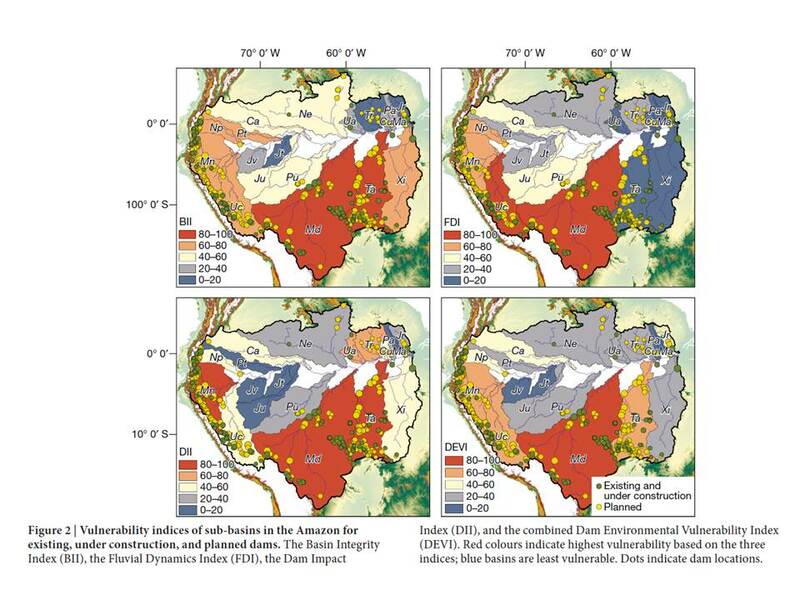 The accumulated negative environmental effects of existing dams and proposed dams, if constructed, will trigger massive hydrophysical and biotic disturbances that will affect the Amazon basin’s floodplains, estuary and sediment plume. We introduce a Dam Environmental Vulnerability Index to quantify the current and potential impacts of dams in the basin. The scale of foreseeable environmental degradation indicates the need for collective action among nations and states to avoid cumulative, far-reaching impacts. We suggest institutional innovations to assess and avoid the likely impoverishment of Amazon rivers.